If you are in Split and you are a tourist, it is imperative you take at least one of the many boat tours offerd in Split. 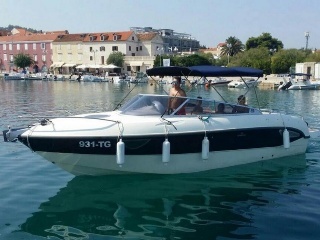 Split boat tours or Split boat transfers to the many Islands like, Brač, Hvar, Vis, and Krknjaši are some of the most notable islands that Croatia has to offer. if you are at the airport and don’t know how to get to the many boat tours, don’t worry, our car transfers will take you to wherever you need to go! Boat tours will take you on a one day trip (or half day) while transfers give you the power to go and leave whenever you want! We pick you up and drop you of where and when you want! So you can take your time, enjoying the many island, cafes, beaches, food and drinks Croatia has to offer! One of these islands is Hvar, Hvar Is a island 60 kilometres from the city of Split. You can read more about day trips to islands from split in our article where you can take boat tours from split or boat transfer to many islands Croatia has to offer! 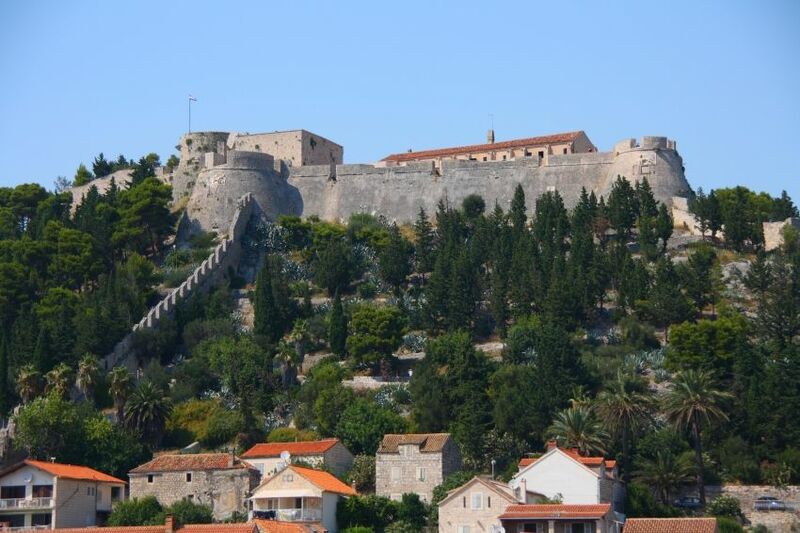 When you arrive at Hvar your eye will most probably first notice the castle that is standing on a little hill directly above Hvar, the castle is called Fortica. The castle dates back to somewhere around 500BC and it is a ancient Illyrian settlement, the view looking down on the city and especially at night is something that you really need to experience! Next that you will most probably visit because its in the centre is the Sqaure of Sv.Stjepan! It is pretty big, it stretches all the way from the harbour to the cathedral, and it actually covers 4500 square meters! It also is one of the most oldest squares in Dalmatia! Here you will see a lot of places where you can sit and have a drink, it is the city centre of course! Ancient Greeks where the first people to found Hvar, when they founded the colony of Pharos in 384 BC but not in the city of Hvar, in Stari Grad which is the current second biggest city on Hvar and located close to the city of Hvar. With that in mind, Stari Grad on the island of Hvar, is one of the most oldest towns in Europe! Today, the island of Hvar is a very popular destination and you really need to take a boat tour from Split to Hvar in order to really experience the island! 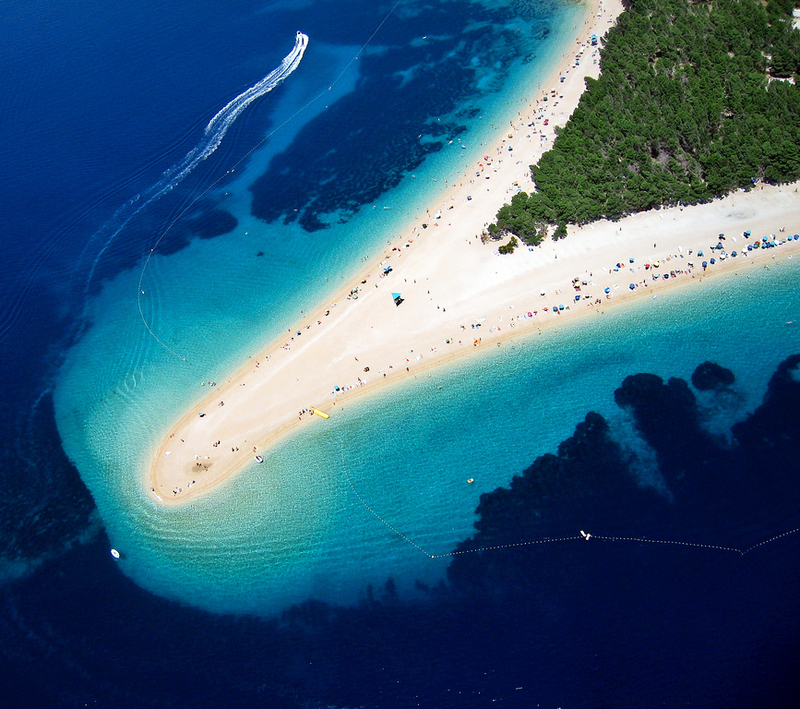 Next to Hvar is the island of Brač on which is home to one of the most popular beches in Croatia, the Golden Horn or in Croatian called, “Zlatni rat. Golden Horn is a symbol of Croatia and is a popular spot for tourists and locals! The beach is unique in shape, because it changes! The change happens only once in a few years, the whole beach shifts either right, left or stays in the middle. It moves mostly due to the wind called “Jugo” which is more known as sirocco. As you can see, the beach looks stunning! Many websites rank it as one of the most beautiful beaches in Europe. Cntaveler put the beach in the top 10 best beaches in Europe. Part of the beach, specifically the west part is actually clothing-optional! Golden horn is one of the most photographed beaches in Croatia, the beach extends about 400 meters and it is constantly crowded with many tourists, it’s a hotspot! 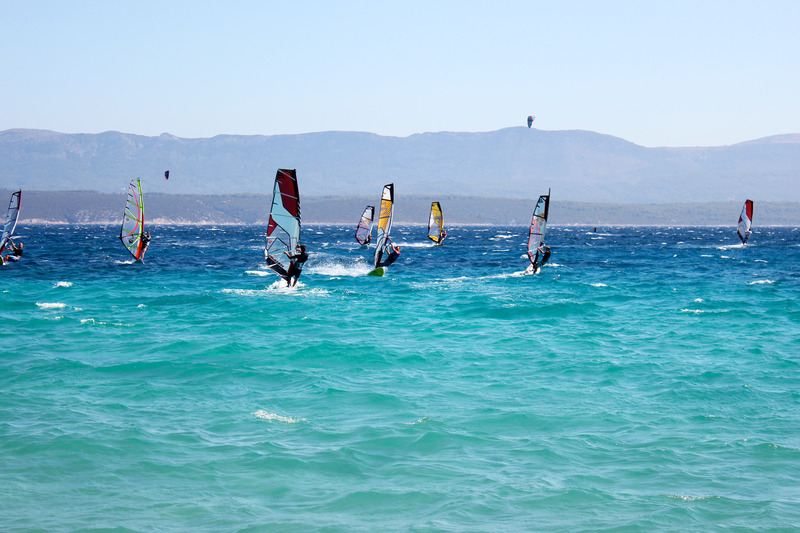 The beach is close to the city of Bol, and Brac is not just the beach its more! In the city of Bol you can find a gallery which displays paintings and sculpture’s from the 20th century Croatian artists, and it is a lot of paintings for such a small town with just 1,500 people! You can see sculptor work by Ivan Mestrovic and painter Ignjat Job and the gallery is named after Dešković a sculptors who was born in Brac and was very famous for his time, you can find one of his most notable works, in the courtyard of the gallery. About half a kilometer from the center of Bol is a Dominican Monastery from 1475, very old! And close to it are a few little chapels which are even more older! From around 9-10th century! There is also a museum near by where you can find manuscripts, coins and many other archaeological items that were found thru history on this island! There is also a winery close by where you can taste the finest Croatian wines in the first co-op wine warehouse in Croatia from the 1903! In the hills close to Bolt there is a cave called “Vidova Gora”, where a interesting and unusual set of reliefs decorates the cave`s walls, the carvings include animals, angels and a dragon! 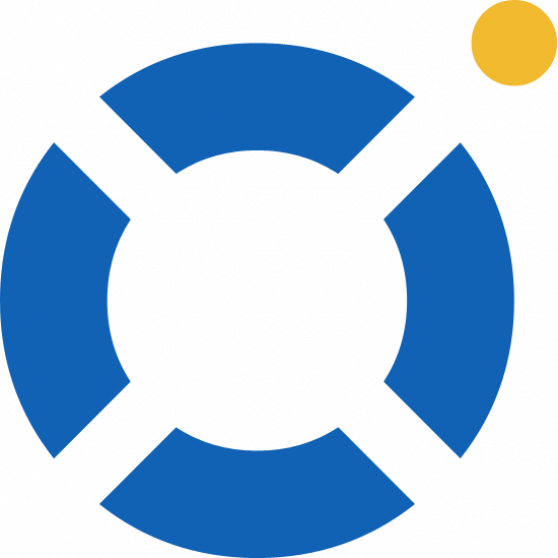 It looks like a blend of Christian and Pagan symbols. This is ideal for people that love hiking but, since the path to the cave is really complicated and really steep, the cave can only be accessed with a guided tour. Second main attraction in Bol next to the Golden Horn beach is the “Our lady of Carmel church” which is a baroque style church built somewhere around 1668 and 1788. It has beautiful rose windows, a clock and a stone angel holding Veronicas veil over the door. So, to sum it all up, in with our one boat tour, you can visit Bol, Hvar, Pakleni island, and Milna on the Island of Brač! Or if you want to visit just one of these locations on your own and have all the time you want, our split boat transfer will pick you up anywhere you are and drop you off wherever you want to go! Heard about nostress4u? You can book our tours thru nostress4u as well or by sending us a booking request directly!